(Montreal, Que.) The competitive fire still burns for Paralympian Elaine Allard. While her days as a fixture playing for the Canadian national team are behind her, the native of Saint-Eustache, Que. has set her sights on coaching Canada’s next wave of up-and-coming athletes. As a coach, she is now looking to return the favour. She has the opportunity to do just that in her role as an assistant coach with her home province of Quebec at the upcoming 2019 Canada Games in Red Deer later this month. As an athlete, Allard made her debut for Canada with the Senior Women’s National Team in 2007. In nine years with the national team program, she competed for Canada at the 2012 Paralympic Games and earned gold and bronze medals alongside her teammates at the world championships. While Allard’s experience on the court speaks for itself, she is excited about the new challenge before her as a coach. 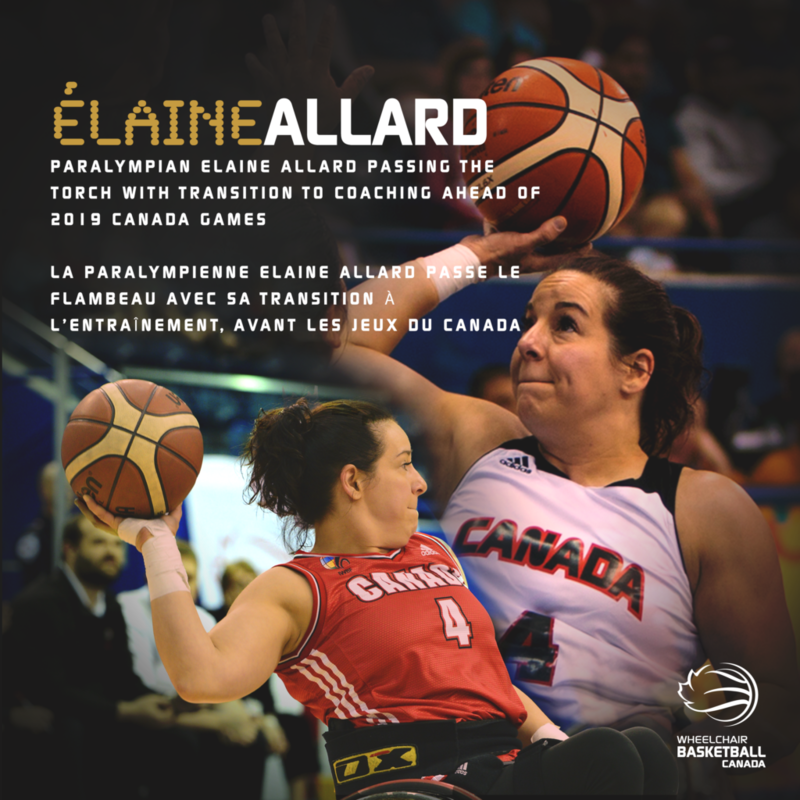 “To have had a long basketball career both at the junior level and also with the national team, it brings a lot to my coaching experience,” said Allard. Quebec has established something of a dynasty by dominating competition at the Canada Games in recent years. La Belle Province has claimed four consecutive gold medals in wheelchair basketball and a flawless winning record of 21-0 in four appearances at the Canada Games dating back to 2003. With the 2019 edition of the Canada Games on the horizon, the winds of change see Quebec enter the competition with just two returning players from the championship team in 2015. Allard joins new head coach Nicolas Palmer behind the bench, along with returning assistant coaches Karine Côté and Jonathan Gariépy. Allard will be coaching in Red Deer after being named as an apprentice coach by the Canada Games Council through the Women in Coaching Apprenticeship Program, which provides opportunities for developing coaches to gain valuable experience and mentorship as teams prepare and compete at the Canada Games. “With my new role, I’m very proud and very privileged to have been chosen for this program and also to have women’s national team coach Marc Antoine Ducharme as a mentor,” said Allard. Allard has known Ducharme for more than two decades as a coach, teammate and friend. Both have a history at the Canada Games as well. Allard played for Quebec and won a silver medal at the 1999 Canada Games in Corner Brook, N.L. Ducharme was her teammate at that event. He also competed and won a gold medal in 2003 and went on to help coach Quebec to gold medals at the Canada Games in 2007, 2011 and 2015. The chance to learn from Ducharme as a mentor provides Allard with a great opportunity to grow as a coach, but she also recognizes the support from the greater wheelchair basketball community as she begins her journey as a coach. The 2019 Canada Games get underway on February 15 in Red Deer, Alta. The wheelchair basketball competition runs February 17-21, 2019. Visit wheelchairbasketball.ca for the complete tournament schedule.